The ideal companion to the Professional levers. The Utility has been extensively field-tested to insure that it will fit on any pin, in any piano, that you are likely to run into in the field. Because it's made in the same way as all the other Levitan levers, the Utility has the same intimate feel. The Utility outperforms most other tuning hammers in common non-tuning tasks such as string repairs, turning balance rail glides, and tapping bridge pins, jacks, and other small parts. The Utility shines in the small confines afforded by the large overhanging lids of many American verticals from the mid-1900s. The Utility is light enough that it can be easily lifted from a tuning pin by its handle, For that reason, it practically jumps from pin to pin during pitch adjustments, especially on verticals. The Utility takes up little space and weight in a tool kit. Because it is simple to make, it is considerably less expensive than almost any other hammer on the market. The universal fit, small size, light weight, and low cost of the Utility make it the perfect choice for an auxiliary or emergency tool kit, or for a pianist who wants an inexpensive but attractive tuning hammer for touching up unisons at home and on the road. ...on just about any grand. 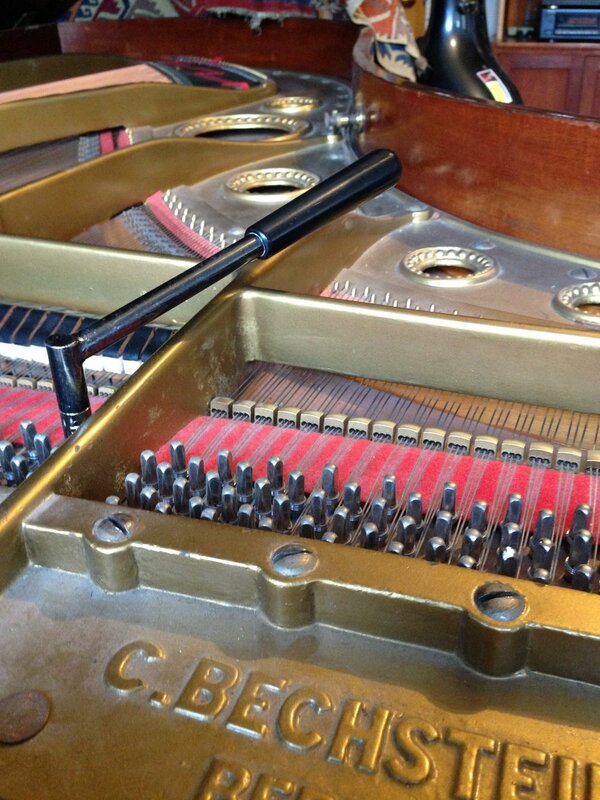 ...and this Bechstein model B. Here it slips between the lowest pin and the case of an Emerson spinet. ...during a vertical pitch adjustment. ...or wherever you'd use a small hammer. Length, center of head to end of handle: 9 3/4"
Height, end of tip to underside of shank: 2"
Shank: Steel, black oxide finish; overall diameter, 0.50"; wall thickness, 0.042"